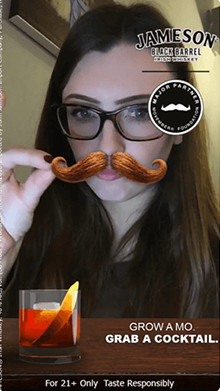 We launched our Snapchat lens giving users the ability to swipe between three different mustache styles and their corresponding cocktails with the instruction of “Grow a mo, grab a cocktail.” Users not only had fun with the mustache styles but also got creative, even pretending to drink the cocktails in the bottom left of their screen resulting in many shares between consumers and increasing awareness for both Jameson Black Barrel and Movember in the process. 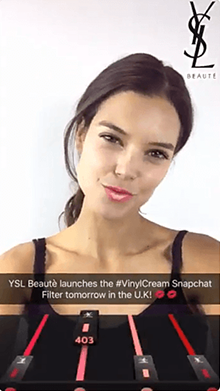 YSL has launched it first Snapchat lens in the UK. 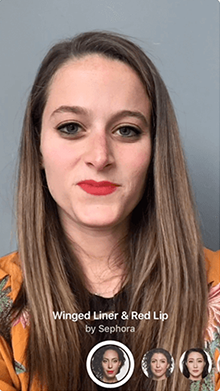 The interactive lens allows consumers to try out shades of its new Vernis à Lèvres Vinyl Cream liquid lipstick. 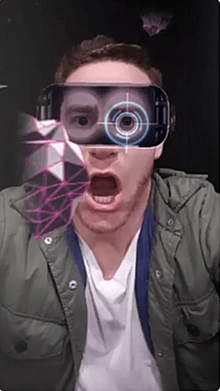 These snapchat geolenses allow users to animate their selfies with something other than the stock snapchat lenses. Along with unique animations, these geolenses also include the sponsoring brand’s logo and sometimes the companies products. 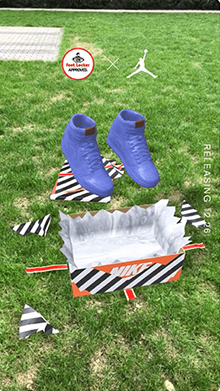 The Samsung geolens Includes the Samsung virtual reality goggles that turn your phone into a virtual reality. 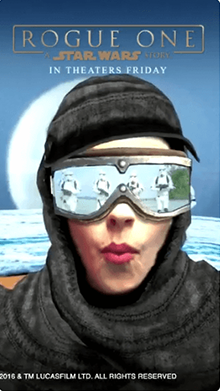 Make your world a little more “beautiful” with Empire and STAR’s Facebook karaoke camera effect! 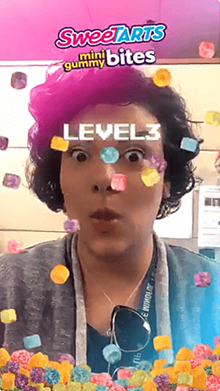 On the day of the musical’s airing, Snapchat launched a Hairspray-themed National Lens, which applied “You Can’t Stop the Beat!” hairspray and makeup to Snapchatters’ selfies. 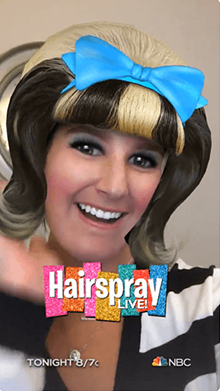 By the end of the day, NBC’s Hairspray Live!Lens had reached over 26 million views with its highly memorable and enjoyable execution. 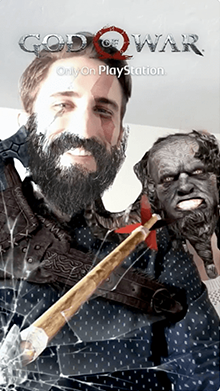 An Audience Lens empowered PlayStation to have some fun with the God of War IP, while respecting the brand legacy that has mad it so popular with fans. 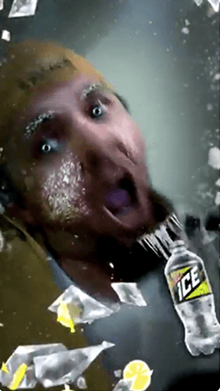 Targeting male gamers 18+, the Lens left Snapchatters bearded and scarred like Kratos, the game’s hero. It also unveiled a surprising new character in his son Atreus. 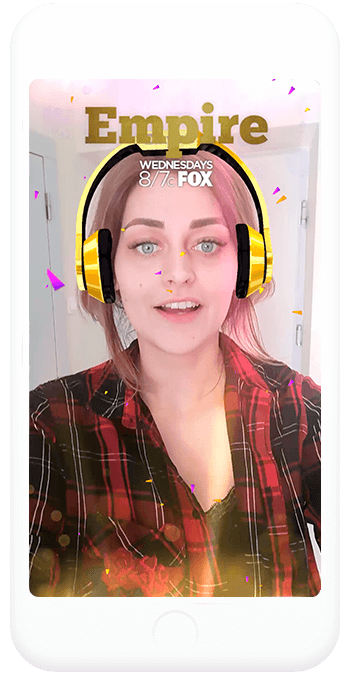 It was the first time ever use of an Audience Lens for a gaming company and was next to impossible not to share. 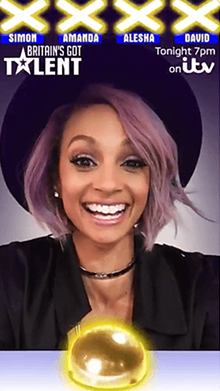 We focused on new mobile and social tools to help us naturally fit into the conversations millennials are already having with their friends. 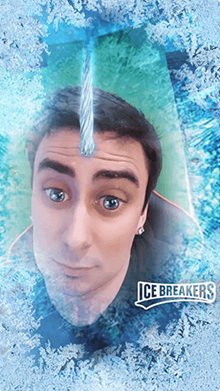 With Hershey’s first ever Snapchat lens that lets you turn yourself into the Ice Breakers Unicorn, we are aligning our brand in a relevant way to help foster the conversation around celebrating your inner unicorn on National Unicorn Day. 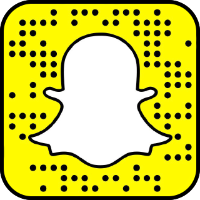 Users on Snapchat can now get in on the Batman Vs. Superman craze as a new lens is available that transformers users into the Dark Knight. 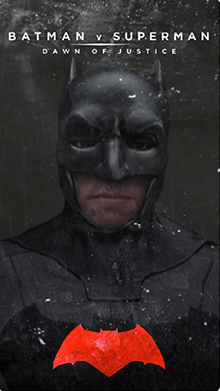 Snapchat users can tap on the filter and raise their eyebrows which triggers the Batman costume; backing away from the phone will put the Bat symbol on the user’s chest. Are you brave, selfless, kind? 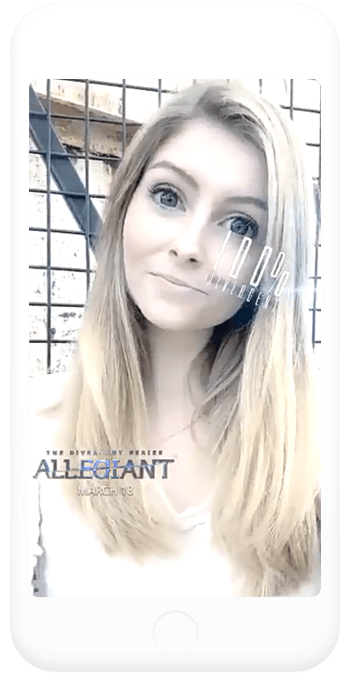 Check out #Allegiant’s Snapchat lens & show us your personal style! 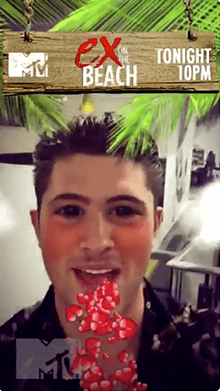 For the past two days there has been a terminator themed snapchat lens that turns you into the terminator. 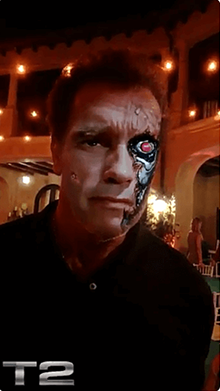 The lens starts by doing a face swap with Arnold Schwarzenegger then it adds sunglasses. Once activated there will be a mini explosion and the glasses will fly off and the metal skeleton below the skin will be exposed. Read more: On The Line Social Media. 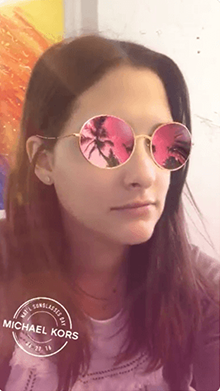 What is The Terminator T2 Snapchat Lens For?  AT&T, a world leader in communications put their fans on the AT&T Time cover. 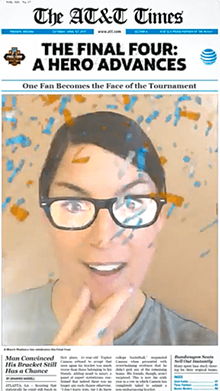 Raise your eyebrows to enjoy fame and splendor as a face of the Pro-Am tournament! Step in the shoes of Britain’s Got Talent contestant and open your mouth to press the golden button. Yup, the confetti is all in your honor. Everyone has got a talent, right? 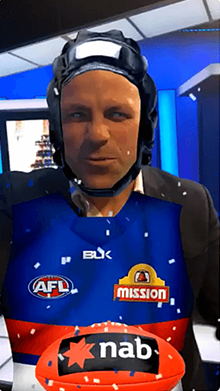 The sponsored Snapchat lens was a particular success. 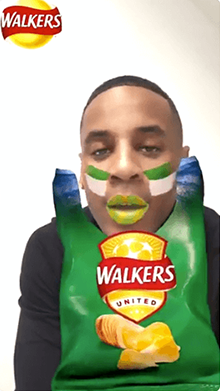 Launched for one day during the Champions League, over 6.3 million Snapchat users engaged with the lens, including Reggie Yates. 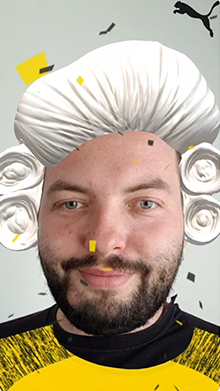 To celebrate the MTV reality show coming back to our screens, we’ve created an official Snapchat lens and the cast have been playing around with it all morning. FYI, the lens puts you in a sunny beach setting (looking lush, obvs), then you open your mouth and the screen goes black-and-white! 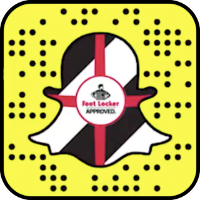 During the Super Bowl, fans will actually be able to cheer on their favorite lip-syncing rapper through a sweet Snapchat lens. 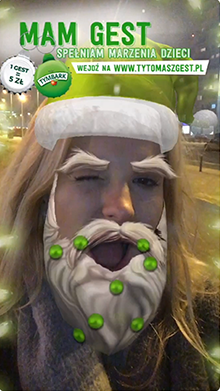 The idea is that Snapchat users will then perform original rap battles of their own by using the filter. 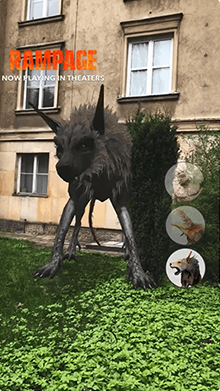 On the occasion of the premiere of Rampage – the new action/sci-fi movie starring Dwayne The Rock Johnson, you can see how some mythical creatures would look on your lawn. 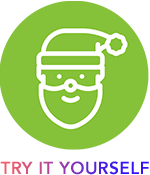 Just tap the screen twice to flip your camera!